Some of my vintage clothing finds are the pieces in my closet that are nearest and dearest to my heart. Perhaps it's because of the time and effort I spent uncovering them amidst mayhem in noisy, crowded secondhand shops, or maybe it's their one-of-a-kind nature that makes me treasure them more. This vintage crochet sweater has become my throw-on-and-go piece of the season, especially for cool summer nights. It's circular pattern caught my eye on the racks of a local thrift store, and its oversized fit makes it ultra comfortable with everything from short distressed cutoffs to skintight skinnies. Fortunately, it had no stains or rips, and was priced at less than a pack of gum. Inexpensive and in great condition - that's quite a victory in terms of vintage shopping, and worthy of at least one Patrick Demarchelier-inspired jumping in mid-air photo. 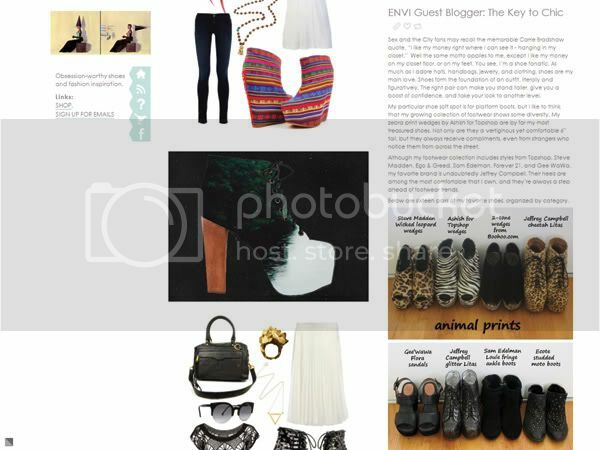 ** I'm excited to announce that I'm a guest blogger for Envi Shoes. Be sure to check out my post, in which I open up my closet and share 16 of my favorite pairs of shoes.